Feeling completely out of place, I try to make myself as inconspicuous as possible in the parking lot of the Bangalore Golf Club. Swank, top-end cars, dime a dozen, dot the landscape. Some 15 feet above them is a long carpet of safety nets designed to ensure that stray balls from the adjoining driving range don’t leave behind a trail of expensive dents and shattered glass. Caught up in my own safety net, I control the urge to shoot glances left and right, trying to spot the familiar figure shuffling towards me. Suddenly, I am startled out of my reverie as the soft chime, “Hello chief, sorry to keep you waiting”, gently pings my ears. I whirl around to find cricketing royalty by my side, the twinkle in his eyes and the smile that stretches from one end of the face to the other clear indications that he isn’t unaware of my acute discomfort. “Traffic,” he says. The one word Bangaloreans love to hate, the one word that conveys a million meanings. As we walk towards the elevator, a dozen hands are raised in salute. Shyly, he returns every greeting. It is an action that is to repeat itself with gratifying regularity over the next four hours. Gundappa Viswanath. A name one had gotten used to growing up, pronounced differently by radio commentators from different countries but all with the same underlying theme – of vast admiration. My father told me once that he was the artist to Sunil Gavaskar’s artisan. Pre-television, that allowed me to let my imagination wander wild. The images my mind’s eye concocted were magical, mystical, mesmeric. All those thoughts come flooding back as we sit down to a leisurely lunch. ‘Vishy’ allows me to take the lead – how typical! – as people stream across to our distant table to shake his hand and enquire after his well-being. There is neither smugness nor satisfaction as I furiously, surreptitiously, search his face for tell-tale signs. Just a natural acceptance of the order of things, but without any outward indication of the awareness of his stature and persona, of his towering presence despite what he calls ‘medium height’. India managed to eke out a draw after conceding a 28-run lead to Australia. It was the first of 14 Test hundreds by Vishy. Remarkably, India never lost when he touched three-figures. After that first faceoff against the Aussies when he stacked up two further half-centuries and an unbeaten 44 in the eight Test innings, Vishy’s next outing was to the Caribbean, on the historic 1971 tour. He had a decent outing, not an outstanding one, but it was a tour that was to change his approach to batting. To playing spin, in particular. “It was my first tour abroad with the Indian team. Big names like (Garry) Sobers and Kanhai were still playing for West Indies,” he recalls. “They had been my heroes since I was 10 or 11 years. And now I was playing against them, it was unbelievable. I wasn’t in the playing eleven for the first Test in Kingston, but I had to pinch myself for the reassurance that I wasn’t playing against them only in my dream! In the first Test itself, I saw a great innings each from both of them. Kanhai scored 158 not out in the second innings, and Sobers scored 93, to save the game after we forced them to follow-on for the first time ever. 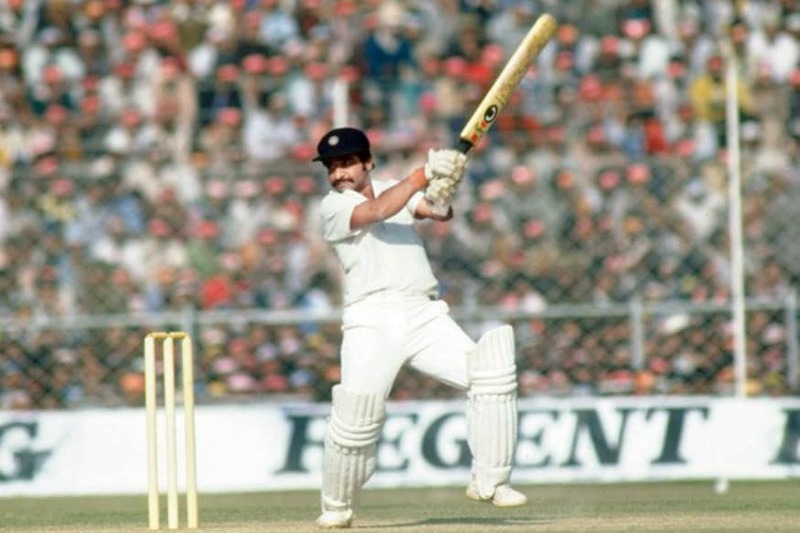 India’s 1-0 series victory was fashioned by Gavaskar’s 774 runs in four Tests in his first series, and excellent contributions from Dilip Sardesai. S Venkataraghavan returned 22 wickets in five matches, Bishan Bedi took 15 and Prasanna 11 in three. West Indies’ most successful bowler was Jack Noreiga, the off-spinner, with 17 scalps. Among the quicks, no one took more wickets than John Shepherd, who finished with seven sticks. “There were no big names among the West Indies fast bowlers at that time. They were trying out newcomers. Wes Hall had just retired and Charlie Griffith was not there. A couple of them came and went out just as quickly. What I am saying is that the West Indies attacks that I faced later were a lot more fearsome and menacing,” he explains. “Like, in the next series in India (in late 1974), the attack was totally, totally different. That was the real fast stuff I came to experience and play against. That 1974-75 series was to immortalize the legend of Vishy. With India trailing 1-2, the teams headed to Madras (then) for the Pongal Test in January 1975. “I know, I know,” he says with feigned irritation, settling down to relive the knock that still awes those that were privileged to see it. India were down in the dumps on the first morning, 76 for 6 after Pataudi opted to bat. That they recovered to post 190 was entirely due to the genius of ‘medium height’, whose rapier-like bat shredded Andy Roberts, Bernard Julien, Keith Boyce and Vanburn Holder, as fearsome a pace quartet as had bowled in India till then. There was no fairytale hundred – maybe the hundred would have taken away from the fairytale – but 14 magnificent fours cascaded off his willow as he finished on 97 not out. Ask him what he most remembers about that knock, and pat comes the reply, “The stroke-making. We were 70-odd for 6 with Karsan (Ghavri) at the other end. I thought whatever we can muster, let us take it gratefully. I had confidence in our spinners, anything in the region of 220 in the first innings would be a good score. But to get there from where we were was a tall order. The only way we could post a total was for me to make the bulk of the runs by playing my shots; I took a calculated chance. The shots that I played that day, I knew even then that I would never play that kind of innings again. Some of the shots, I couldn’t believe myself. Kalli (Alvin Kallicharan) and (wicketkeeper Deryck) Murray couldn’t believe what they were seeing. When I looked back at the slip cordon, they were shell-shocked. Vishy loves narrating how he was left stranded, three short of three-figures. “The way Keith Boyce fielded in that match was amazing. That particular innings, his pick-up and throw was the best I have seen,” he whispers, properly awed. “Myself and (last man BS) Chandra(sekhar) took singles off the last ball of most overs to fielders like Clive Lloyd, Gordon Greenidge, Viv Richards, Alvin Kallicharan, Roy Fredericks, sometimes even to the bowler on his follow-through, so that I could keep the strike. All these are brilliant fielders anywhere on the park, but they missed nearly a dozen clear run-outs. “I was on 96 and Andy was bowling when I played the square-cut, of all shots,” remembers the God of the square-cut,“ and it was one of the best square-cuts I have played. I ran casually, confident that it would be a boundary. I was so happy on the inside that I had got to a hundred; luckily for me, I didn’t raise my bat. I was so bloody sure it would cross the boundary – whether it was Boyce or his father, no chance of stopping it. But when I had sauntered three-fourths of the way down the track, I saw Boyce pick up the ball. My euphoria vanished, I just froze. By then, Chandra had completed the first run and was desperate to come back for a second, but there was no way I could have made my ground in time, so I screamed to him to stay put at the striker’s end. A couple of minutes of silence, him reminiscing, me soaking in the moment, before I steer the conversation to the famed square-cut. “It is all a myth,” he says of the stroke many insist is the closest to cricketing perfection. “It is not perfect, nobody is perfect. I got out playing that shot quite a few times. Most of the bowlers, they don’t bowl up to you except when the ball is new and there is something in the atmosphere. Most of the time, they hit the deck, which is pace, pace, pace. It is a little short, skidding, you have to play that shot. Because of my height, I couldn’t go back and pull from that height. Someone like Andy had two bouncers – one was too short, the other one skids through and just passes through around nose height. Nothing to beat (Michael) Holding, beautiful run-up. But (Colin) Croft was dangerous, comes behind the umpire and the peels away at the end. His head falls to the left, so the ball comes in sharply. Huge he was, and quick. And (Joel) Garner was up there (pointing to the sky), just looking at him would give me neck pain! When he cut his teeth in international cricket, Vishy had had no exposure to playing fast bowling. Still, he only got hit twice in his career, both times in the Caribbean. The first was in 1971 when a Holder lifter shaved his head, an accident that necessitated him to spend the night in hospital under observation. The second was during the bloodbath of 1976 in Kingston when Holding smashed his right middle finger and put him out of action. “Luckily, our next Test was seven months away, so I could maintain my streak of not missing a Test,” he smiles, then conspiratorially whispers, “I did get hit between my eyes once, but by a spinner! We were having nets on a bad surface at the Chinnaswamy Stadium, and Raghuram Bhat (the left-armer) got the ball to turn and bounce alarmingly from a spot. I went forward, and bang! Nailed just above the bridge of the nose.” Not sure what to make of it, I look at him quizzically. “Not kidding. Look at this mark here,” he proclaims, wearing his battle scar as a badge of honour. 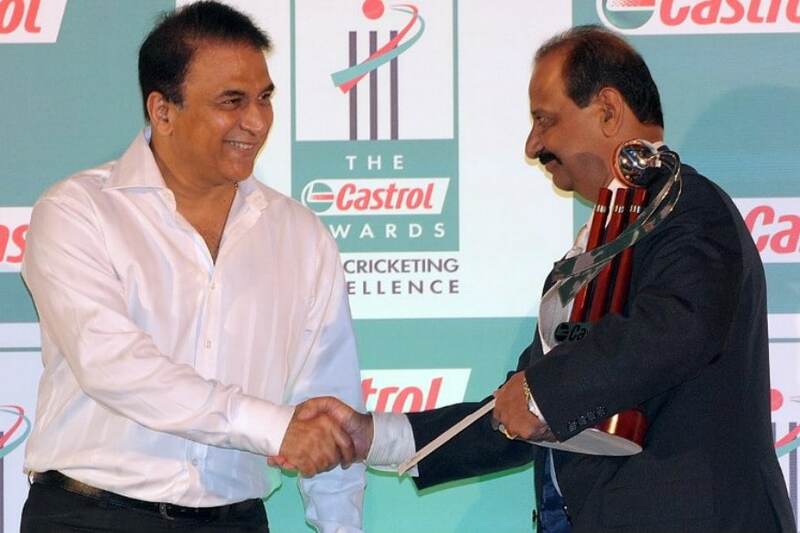 Pataudi has called Viswanath the best Indian batsman against fast bowling – and Gavaskar the most proficient against spin. Vishy smiles as he remembers his first Test captain’s words. “I worked on a few basic things, pretty much on my own,” he offers. “I would ask someone to throw the ball from 15 yards, a wet tennis ball, on a cement patch, a concrete slab. I played that way quite regularly. That helped not only in getting used to the pace, not only in playing the hook or cut, but also to come into the line of the ball as quickly as possible. Then, you can play the ball, or leave it too. Leaving the ball is also an art. If you see the ball early, you can leave the ball. It made me quite comfortable, that practice. By now, his designs of a round of golf have been scuppered by a massive downpour, the unchecked pitter-patter drumming a relaxing beat on the roof. I apologise, only half-heartedly, for having messed up his plans. “Good you have held me up, otherwise I would have been soaked to the bone like those guys,” he punches my shoulder, pointing to a couple of gentlemen who have been caught unawares mid-course by the sudden rain. I notice how much he has to stretch to punch me, so it provides the opening – had his height been a boon or a bane? As good a note as any to round off an afternoon of entertainment. Gundappa Viswanath, ‘Vishy’, is a treasure trove of wisdom and knowledge, a man of warmth and affection. A legend, and yet a simple man who perhaps still doesn’t realise how many lives he has touched with the deftness of his willow, the softness of his words and the bigness of his heart.